One of the most famous album covers of all time produced by one of the most famous bands of all time was thrown together at the last minute. In fact, it was put together at a time when the Beatles were falling apart. The recording of the album was the culmination of lots of arguing and tense compromises among the four musicians. As George Harrison said, it felt “as if we were reaching the end of the line.” The Beatles were planning on releasing the album under the title Everest, named after their sound engineer Geoff Emerick’s favorite cigarette brand. The art on the cigarette packs was a silhouette of Mount Everest, and the band liked the image. To create a similar look for the album cover, the band was going to take a private jet to the Himalayas and get the cover photo. But deadlines were closing in, and EMI was demanding a product from the band. Under that amount of pressure to produce a quality album, especially in the midst of so much forced compromise, the band was desperate to get the album done and over with. 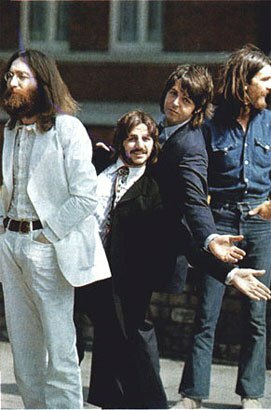 So Paul McCartney suggested they all just go outside and get a photo of them crossing the street outside their studio. He said they could simply name the album after the road. The band hired a photographer, Iain Macmillan, and a police officer to block traffic. “A few days before the shoot, [Paul] drew a sketch of how he imagined the cover, which we executed almost exactly that day,” said Macmillan. 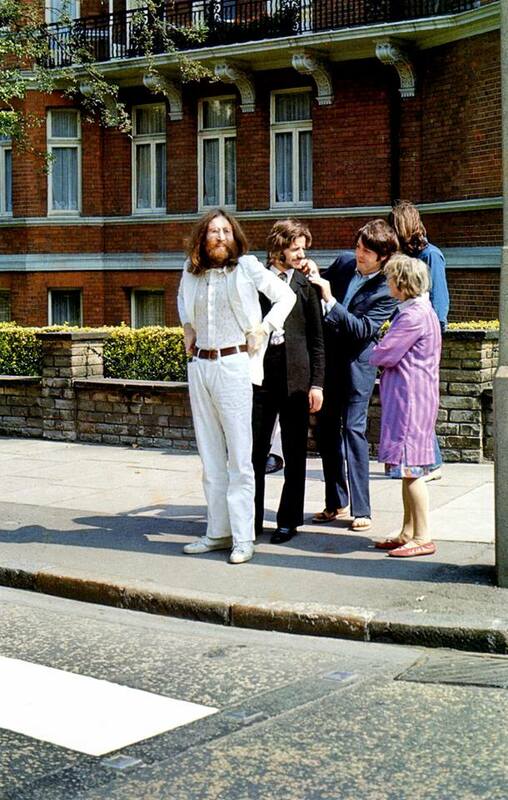 At about 11:30 AM on August 8, 1969, the band went outside and Macmillan set up a step ladder in the middle of the street. 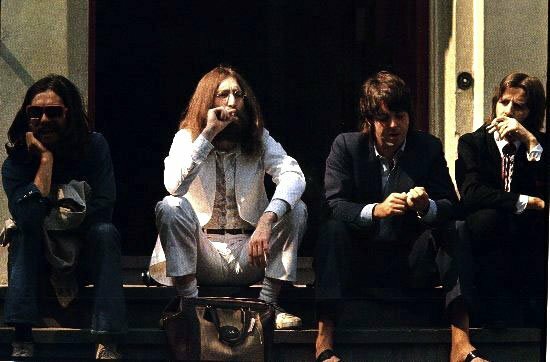 Paul, Ringo, and John all wore suits designed by Tommy Nutter, but George opted not to match. In addition to that wardrobe choice, Paul wore sandals for shots 1 and 2, but then decided to go barefoot for shots 3-6. (This later erupted as a “clue” for the Paul Is Dead myth. Paul much later responded to this by producing his fourth album with a retouched version of the Abbey Road cover and naming it Paul is Live.) 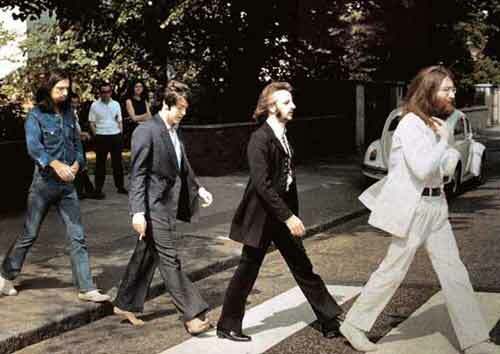 “I took a couple shots of the Beatles crossing Abbey Road one way. We let some of the traffic go by and then they walked across the road the other way, and I took a few more shots,” said Macmillan. The whole thing took 10 minutes, mostly because the police officer didn’t want to block traffic for too long. “The one eventually chosen for the cover was number five of six. It was the only one that had their legs in a perfect ‘V’ formation, which is what I wanted specifically,” Macmillan recalled. The album, obviously, sold well. 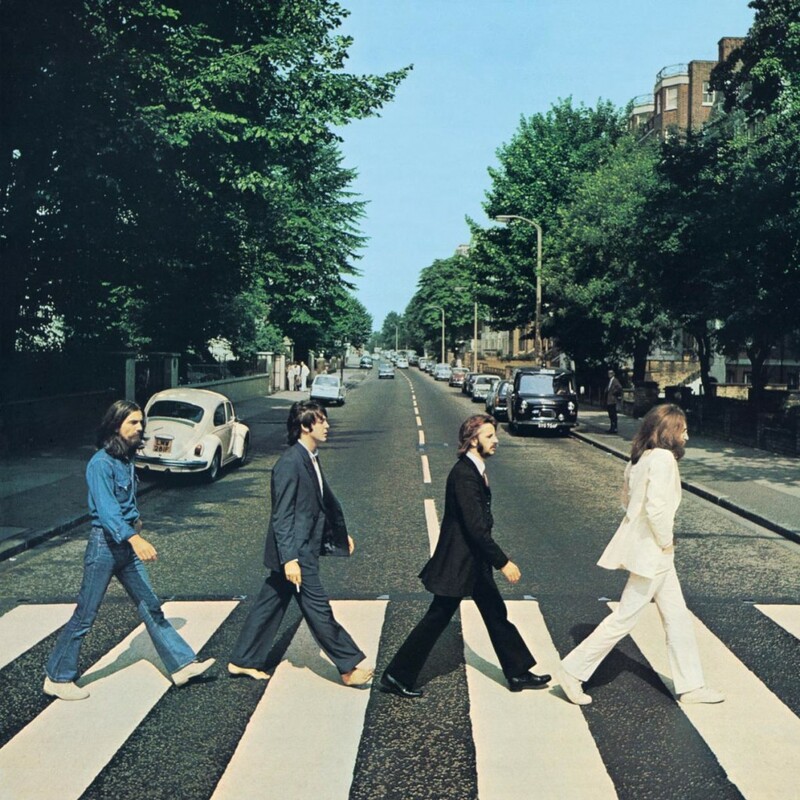 The cover became so famous that the license plate on the white Volkswagen Beetle, belonging to one of the people living in the apartments across from the Beatle’s studio, in the background was stolen. The care was later sold in 1986 for about $3800 and was put on display in Germany in 2001. Another object in the background is a seemingly random pedestrian standing on the sidewalk. An American tourist, Paul Cole, tracked down by reporters after several years, said he was standing on the sidewalk because he was sick of following his wife into places on their vacation itinerary. “I’ve seen enough museums. I’ll just stay out here and see what’s going on outside,” he told her. Cole struck up a conversation with the police officer to entertain himself. “I saw those guys walking across the street like a line of ducks. A bunch of kooks, I called them, because they were rather radical-looking at that time. You didn’t walk around in London barefoot,” he recalled. It wasn’t until Cole’s wife brought home Abbey Road that Cole realized what he had witnessed. “I had to convince the kids that that was me for a while. I told them, ‘Get the magnifying glass out,'” he said, laughing. NO…WAY…I love it when crap like this happens, some project on a whim becomes one of the most famous things ever. That backstory is so crazy! I love the comment “We are the Beetles, it’ll be okay!”. That is so funny, my goodness, I feel like some of the essence of the beauty is the spontaneity of it all! I recognize this photo for sure! :D. I like the history behind it and the fact that if it wasn’t for a studio deadline, we’d never have this epic photo/album cover. Hannah, I’m ashamed to say but it never struck me how much research you put into your posts before today. It was only after you included the bit about the American tourist (which was quite humorous) that I realized, “Wow, she really knows her stuff on each photo”. So an immense kudos to you. Great post and history behind another iconic piece. Can’t wait for your next one :). Can I just say that I can’t imagine being that poor 23 year old, getting that call at 3 in the morning. I don’t think I would be able to sleep after that. Luckily for him, they are The Beatles, so it didn’t turn out to be any problem, and he probably had a good ol’ “I told you so” for Sir Joseph Lockwood (who sounds like the real prick in this situation). This is without a doubt one of my favorite posts of yours. Like I’ve said before, it is so interesting to look at a photo, especially a famous one like this, and get to know the background of it. Before reading this blog post, I never would have thought that all of that went on. I honestly had the impression that this album name and cover had been decided on for a while. It is so bizarre to think about what would have happened if they went with the mountain cover and title. I always love reading your posts Hannah! I thought you may enjoy these..